Talk about a mobile library! 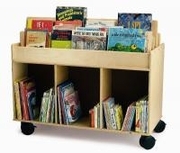 The Mobile Book Storage Island is a sturdy two-sided cabinet that has room for hundreds of books along with compartments underneath for magazines, supplies, etc. Features heavy-duty casters so one adult can move it around the room or school. Minor assembly required. GreenGuard certified. Made in USA. Dimensions: 19in. × 44in. × 30in. Panel Material: Birch laminate .